Situated on the Land’s End peninsula, within a few miles of both the north and south coasts of Cornwall, is where you’ll find our pretty Sennen Cove Club campsite. Although a couple of miles north of Sennen Cove, the campsite does enjoy sea views over the cove from some pitches. Our tranquil campsite has 72 pitches and all the facilities you need including a small play area for the kids, and a playing field for ball games. A small shop sells the basics; a laundry with washing machine and dryer is also available. Gwynver Beach is a 25 minute walk from the campsite. The beach at Sennen is a 45 minute walk away from the campsite. From there, the energetic can walk over the coastal path to Land’s End, another 90 minutes away. Land’s End is England’s most westerly point and, as well as spectacular scenery, there are many family attractions including a 4D film experience and the Monsters of the Deep exhibition. Back in Sennen Cove you can learn to surf. The south coast of the peninsular offers Gwenver and Porthcurno, also the Telegraph Museum, Minack Theatre and Penzance with its historic harbour areas. Also, pretty out-of-the-way fishing coves, including Penberth, Mousehole and Newlyn, with its fish festival at the end of August. North from the campsite, a pretty but very narrow, windy road leads through St. Just and Pendeen. There are some excellent walks around the old mine workings near to Botallack and the Geevor Mine, for those with an interest in this part of Cornwall's industrial past. Further afield, via Zennor, the pretty, but very busy, fishing port of St Ives with its Tate Gallery of modern art is worth a visit. 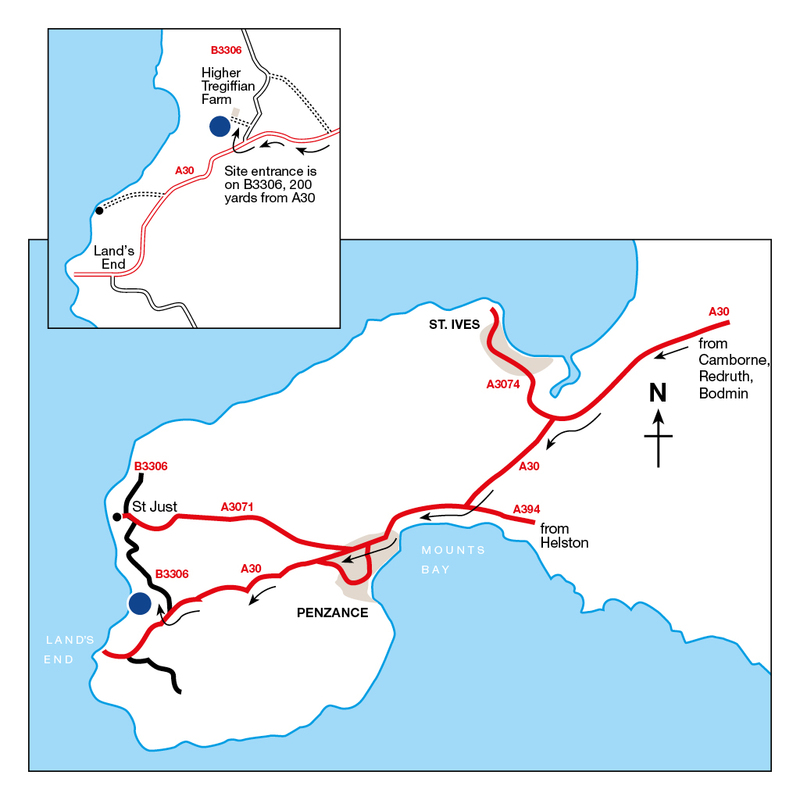 The site entrance is situated on the B3306, approx 200 yards off the A30. Towing units should avoid going into Sennen Cove as turning is difficult. A fish and chip van visits the site twice a week during high season. 100% coverage cannot be guaranteed due to rural location, weather conditions and changing flora. These can cause variable signal strength. More information. There is a farmers' market every Tuesday at Sennen Village Hall, and the butcher in St Just sells locally-reared meat. Located just a couple of miles from Land’s End, Sennen Cove is a picturesque crescent-shaped beach boasting golden sands, ideal surfing waves and even a small harbour. Stroll along the sand and take a tip in the water in this quintessentially Cornish beach. Despite looking like a ruined Mediterranean temple, the Minack Theatre is actually an outdoor Cornish auditorium with a fittingly dramatic backdrop for dramatic theatrical productions. Overlooking the Atlantic Ocean, the theatre is built on the cliff edge and stages several productions each year. Depending on the time of day and stage of tide, you can either wander across the causeway or hop in a boat to get to St Michael’s Mount. Situated on a small island just off the coastal town of Marazion, St Michael’s is home to ancient cobbles, castle walls and sub-tropical gardens. Take a trip to the Cornish Seal Sanctuary and uncover how their work is ensuring the health and wellness of their resident, curious Grey Seals. Get acquainted with the sanctuary’s other sea creatures, including playful penguins and mischievous sea lions. Tregurrian is great for watersports and those looking for a seaside holiday.